At the end of this blog are links to over 100 images from El Tour. 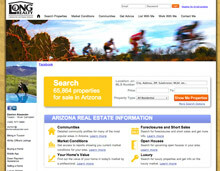 In the weekend before Thanksgiving, the best place to be is Tucson Arizona for El Tour De Tucson. I recommend staying through the Thanksgiving weekend as southern Arizona has so many “Must Do” Rides and it takes a full week just to see even a fraction of them. Tucson is surrounded on all sides by mountains and the valley floor is fairly flat. This gives riders of all levels an opportunity to get out and spin. Personally, my favorite is called “The Loop”. It has over 100 miles of paths circling the city with off shoots going in many directions. It is flat and no mechanized vehicles are allowed. Other must do rides include Mt. Lemmon with 29 miles and 6000 feet of climbing, Saguaro East with 8 miles of one way traffic through the most scenic Sonoran Desert imaginable. If you like to get off roads, Southern Arizona offers thousands of miles of single track and fire roads. 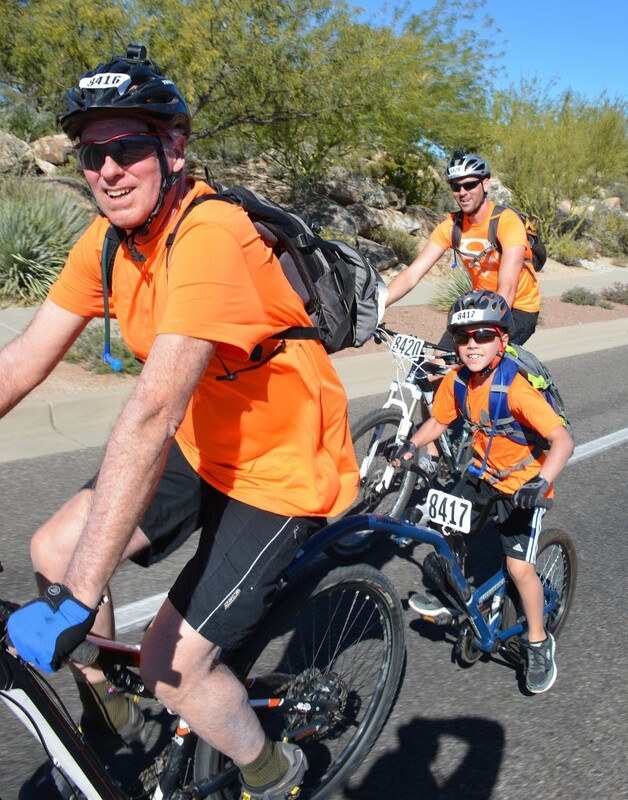 El Tour De Tucson is a bicycling event for cyclists of all ages and abilities who ride 104, 75, 55 or 40 miles in the main event or 11, 5 or 1/4 miles in the fun ride or for minutes not miles in indoor El Tour. Is anything better then a day in the saddle with your sweetie? 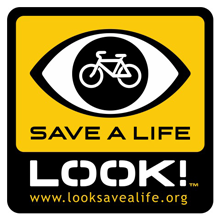 Officially, I registered for the 55 mile ride, but as a photographer I like to get out and see all the action. I had a plan that gives me the chance to catch each race and still finish the day with over 115 miles. My game day strategy was to ride the course in reverse until the lead packs came through from the 104 and 80 mile routes. I would then follow the course until I would diverge to the start of the 55. I’d stick with that group until I needed to veer off to the start of the 40. I help coach a youth cycling team and our kids were riding in the 40 mile El Tour. This year the event is dedicated to former congresswoman Gabby Giffords and her husband Astronaut Mark Kelly. Gabby was part of one of Tucson’s darkest days, when a gunman showed up a “congresswoman on your corner” meetings and killed 8 people. Gabby survived a shot to the head and her return to El Tour is truly an inspiring story. In this blog, I’ll share links to the photo albums I have posted from the event. On the day I snapped about 3000 images and shared over 1000. If you do the 104 mile event, and are interested in the best time, I would recommend showing up at the start line well before sunrise. Many riders camp out to be at the front of the line. For returning riders who had a qualifying time in previous Perimeter Cycling Events, there is a “platinum pass” that allows you to the front of the line. The roll out is fairly slow for most riders and the streets swell from sidewalk to sidewalk as every inch of pavement is claimed. This casual pace continues for the first 15 minutes until the race crosses the Santa Cruz River. For most EL Tours the Santa Cruz is actually a dry, sandy wash. After the wash crossing the field spreads out and it’s fairly easy to find a pack that is your pace. The ride heads South and East as you start to circle the city. For the most part, it feels flat, but there is a gradual climb. Nothing more than a few degrees and if you can ride a century you won’t notice it. Chris DeMarchi and Phil Tinstman off the front with a gap about 30 miles in.. I picked up the lead riders near the Eastern most part of the ride. I was surprised to see a tandem was way off the front with only two riders about 30 seconds back. The chase pack was a few minutes behind and it was only about 30 miles into the race. 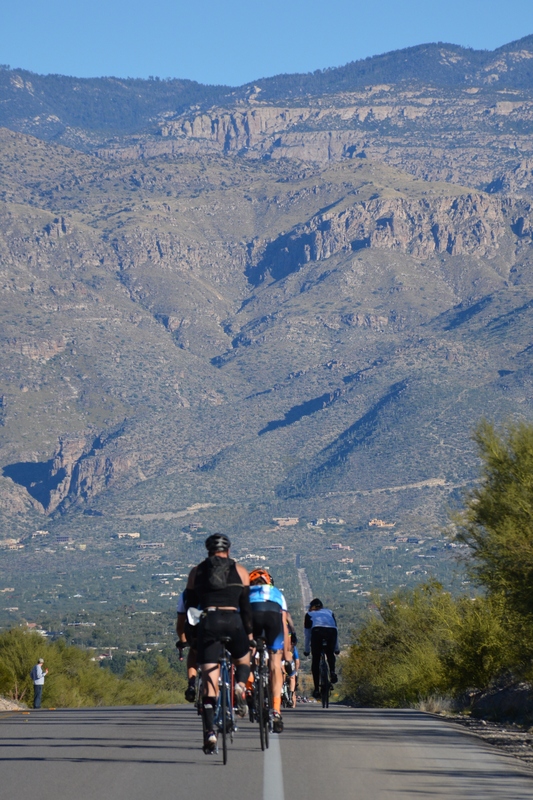 As the race passes Saguaro Nation Park it has a few miles of descent as it drops into the Tanque Verde Valley. If I were visiting Tucson and only had one day, I’d add an extra 8 miles onto my ride and go for a loop through the park. It does have a climb that is far longer and harder than anything you will see during El Tour, but it’s just so incredible I’d be remiss not to mention it. What goes down must come up. The climb out of the Tangue Verde Valley in steady with only one hill just after Catalina Highway. The Highway (it’s only two lanes and is more of a scenic byway) leads to Mt. Lemmon. Just after the small hill the ride turns West. I’ve had El Tours where this is a huge relief as the wind at this time of the morning usually gives you a push. However, in Tucson, you can never be sure. We seem to get wind that is in direct proportion to how tired you are at the moment. This year, it felt like there were tailwinds all day and with the first sub 4 hour El Tour ever recorded, it shows the wionds were definitely favorable. As you head West you are only a mile from the base of the Catalina Mountains and for the next 30 miles the scenery is glorious. The ride passes through a few hundred yards of dirt road that leads through the founder of El Tours property and into Canyon Ranch. The lead riders are able to navigate the road, but by the time I arrived most everyone was walking. 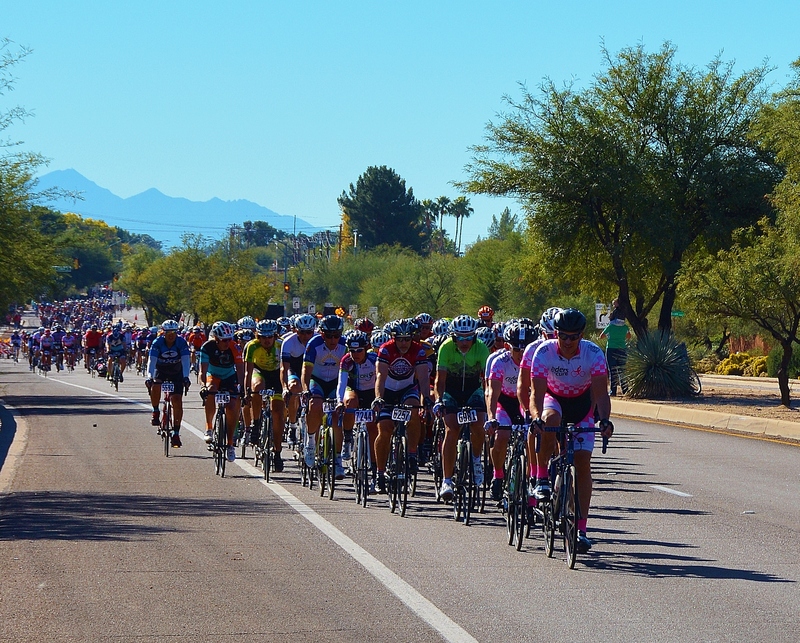 This year Sabino Creek was flowing, but El Tour provided a bridge for dry crossing, but many people still rode. By this time I was getting a little warm and I wanted to soak my knees so I went into the stream. I was rewarded with some of the best photos of the day and I was dry in under an hour. The ride continues through one of Tucson’s gems, The world renowned Canyon Ranch Spa. If you can afford it, it’s worth every penny of it. Voted best Spa in the Universe more than once. Just after leaving Canyon Ranch is the steepest section of the day. Some walk it as it is steep, but most people are able to ride. It is not that long and I cleared it in only a few minutes. Marty and Robin Giles with Riders for the Cure leading out the 55 mile ride. As I continued heading West on Sunrise through the Catalina Foothills the road has long rolling hills. They are not steep, but there is no flat road for about 10 miles. I veered off at Swan and headed to the start of the 55 mile ride. I was having so much fun in the water that I was way behind schedule and missed the start by a few minutes. The 55 mile starts with 3 mile climb up Swan. Again, not exceptionally steep, but very steady. It joins in with the longer rides at Sunrise and heads West to Oracle road. On Oracle road I ran into a long delay. Apparently, the ride was a little congested and the officers were attempting to bring balance to the force. I really would not have minded, but it was clear I was going to miss the start of the 40. On the plus side, this was one of the few times all day that the light is really bad for photos so I was able to put my head down and put in a solid effort once we were waved through the intersection. I used the Loop to avoid some traffic, but still missed the start of the 40 by only a few minutes. Sharmin Pool and Jorgiana Jake wave as they pass on Rancho Vistoso Blvd. I was able to catch Gabby Giffords and her entourage in no time at all, but there was no sight of El Grupito. The 40 mile course starts with perhaps the nicest stretch of blacktop in southern Az for cyclist. 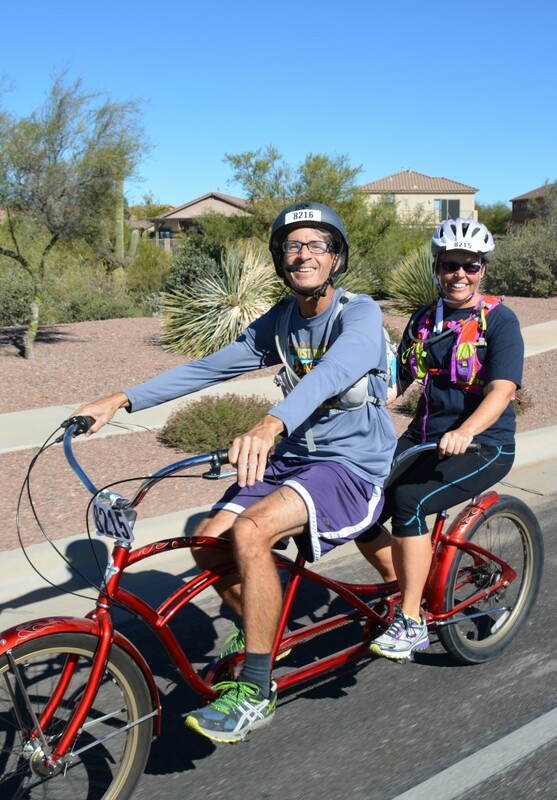 It is in Oro Valley and the roads are smooth, the bike lanes are wide, and the desert is thick with Saguaros, ocotillo, and other desert flora and fauna. Rancho Vistoso Blvd has a climb at the start but after you turn onto Moore road all of the climbing for the day is done. The 55 mile ride bypasses this stretch on Rancho Vistoso and meets up with the 40 on Moore. I have not mentioned the condition of Tucson roads that much as it is sometimes embarrassing. It is a mixed bag. On the South side there are some patches that need serious attention. Parts of Moore Rd could use a fresh coating of blacktop, but this stretch is flat and seems to always just fly by. The old west. 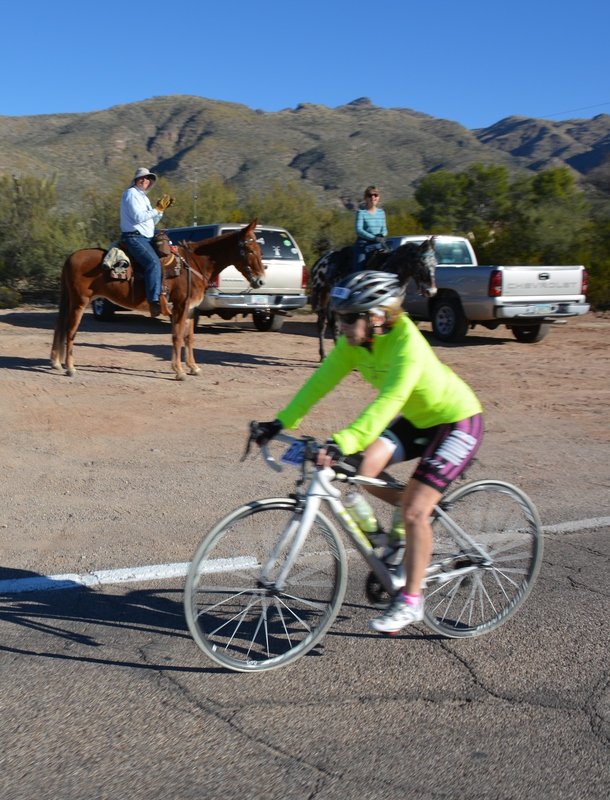 If you prefer old school horses over the iron horse, Tucson has great equestrian trails. One of the great parts about El Tour is the lack of traffic if you are riding at a pace that keeps you positioned towards the front. This is true for every distance. I did not notice any cars at all until just passed Moore Rd. Even on Oracle road where there are three lanes for cars, the bike lane is so wide that you don’t notice the vehicles. However, on Tangerine road, you are in with cars and have a small bike lane. On the positive side, it is a whipping fast descent and the tailwind made it even faster. Some cyclist had taken the entire road some distance ahead of me and I was able to pass all the cars and take advantage of the full road. At the bottom of Tangerine just before the freeway is the aide station that I like to stop at. It is stationed by the Marana Rotary and they always provide Eegee’s frozen drinks. Eegee’s is a local restaurant that makes a frozen fruit concoction that is worth the visit. Every month they have a special flavor and then there are the old standbys, Strawberry, Lemon and Pina Colada. They have been known to cause brain freeze, but I had 3. They also have the ability to slow down kids in their tracks to devour the local fare. Finally, I caught El Grupito . El tour is a family friendly. Many do the 40, but you see kids of all ages in every distance. After the aide station we crossed under i-10 and headed South for 15 miles on the frontage road. Some years, this section is brutal. I’ve made the turn into 20mph winds, but this year it was blowing the other direction. It was just blissful riding all the way to Congress street. At this point they changed the course from previous years. It headed a little farther East through the old barrio and past the Mercado. I liked seeing this addition to give a little Tucson flavor that was missing. As we turned East again on 22nd street I felt the excitement of the finish line approaching. I was swelling with pride and admiration for the kids I was riding with. They had just done 40 miles, in formation, taking turns pulling. As we made the final turn North towards the finish line the kids started to jockey for position, but the coaches recommended they finish 10 across, together. It was only said once and they fell into formation. I went out in front to get a photo and found my eyes watering up a bit. My son, who is a part of El Grupo, and who I’ve seen cross this finish line many time, is away for the semester in Land O’ Lakes, Wi. at Conserve School. The past 7 years, I’ve ridden with him. As excited as I was for El Grupito I was missing my boy more than at any time since he left. We were swarmed at the finish by all of the El Grupo Youth Cycling family. Hugs and high 5’s all around. I said goodbye to the kids and started to mill through the crowd and grab my finishing medallion. In true Gran Fondo style, it was not about the time I finished in, but the journey that got me to the start and the people I met along the way. It was about 3:22 when I finished. Gabby Giffords and her entourage crossed the line at 4:34. I doubled back on the course and finished the ride with them before riding home. I had left home at dawn around 6:45 in the AM. The sun was set and I was riding on The Loop towards home. As I was climbing the last hill on the way home I was thinking how content I would be to do this every day. Yes, my legs were heavy, I felt the effort of the day, but the feelings were in all the right places. If you are heading to Tucson, please feel free to contact me. I put out a weekly ride list of every ride I know of as well as races and events. The biggest challenge I face is that we have so many rides every day it is impossible to do them all. Also, I am a Realtor and have had many clients look for homes on bikes. Nothing makes me happier then putting on Lycra and telling my wife I’m going to work. 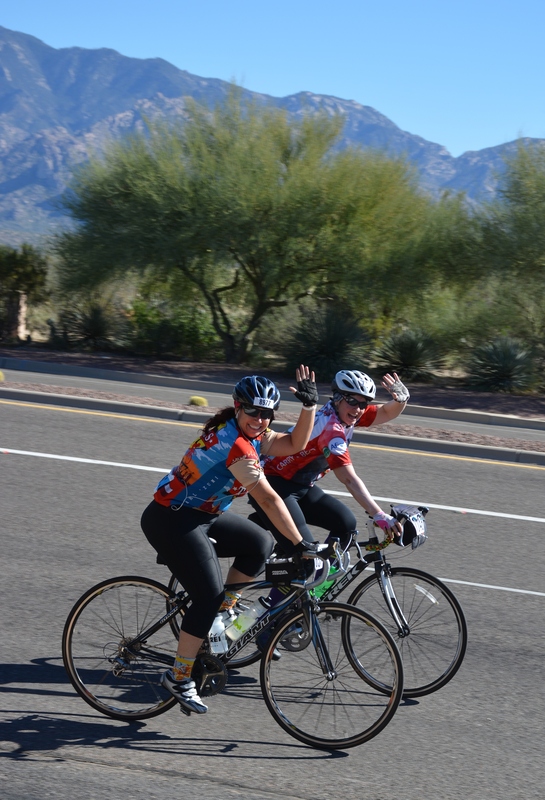 Below are links to the photo albums from the 2015 El Tour De Tucson. These images are also on The Damion Alexander Team on Facebook. If you like cycling photos, you will love this page.